There are many innovations, projects, and programs which can make a community more liveable. The elements that they have in common are 1) the vision of the founder (or co-founders), 2) a dedicated connection to the community and populations in which the innovation or project is located, 3) the necessary social skills and contacts of the founder(s) and other key people involved in the innovation, 4) hard work, and 5) funding sources that continue over time to keep the services (or project) going, as well as to add services as needs change. The DaVinci Center for Community Progress, in Providence, RI, is an excellent example of how to make a community more liveable for diverse populations for whom it has provided services since it opened its doors in 1972. The DaVinci Center is a multi-purpose facility based on the settlement house model in regard to many of the services it offers. It differs from the settlement house model in that the DaVinci Center staff does not live at the Center. The Center was co-founded by John DeLuca who has also served as its longtime Executive Director. 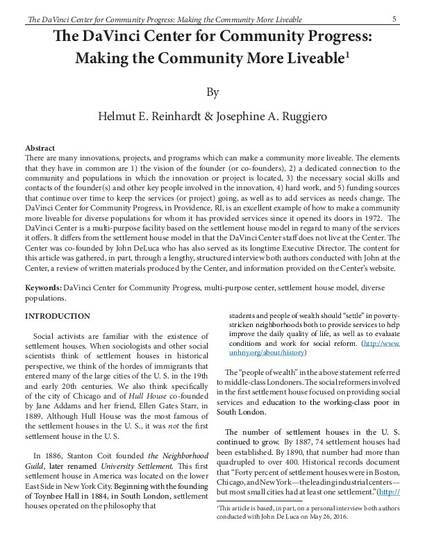 The content for this article was gathered, in part, through a lengthy, structured interview both authors conducted with John at the Center, a review of written materials produced by the Center, and information provided on the Center’s website. Sociology between the Gaps will consider submitted work from sociologists and professionals in related fields providing the content of the submission has not been substantially published previously or submitted simultaneously to another journal or publication, print or electronic. Papers may be submitted by those working in academic, applied, clinical, or other settings. The Editor-In-Chief encourages submissions in English from international authors working on sociological topics.